Four years passed with the worst and the dirtiest crime committed in the region by the US-Saudi aggression after the Zionist occupation forces crimes in Palestine. The Yemenis were sleeping or preparing to sleep on the night of March 26, 2015 and that’s when the neighbors of evil and in coordination with the big sponsors of Zionism were preparing to start the attack on Yemen without the slightest right or less justification. Four years in which the coalition of Saudi terrorism, committed hundreds of massacres against innocent civilians into their homes in a barbaric way, that the world has not witnessed in its modern times. Four years and the Saudi-led coalition did not end its aggression and no one in this world has raised his voice against massacres as it should. During the four years, the US-Saudi aggression launched about a quarter of a million airstrikes on Yemen, threw half a million bombs and missiles on various areas in Yemen, used at least two thousand and 951 light bombs and three thousand and 721 sound bombs, not to mention dropped dozens of fragmentation bombs, and threw about 6,000 phosphorous and cluster bombs, according to the Yemeni Armed Forces spokesman, Brigadier Yahya Sare’e. “The number of raids exceeds this figure greatly if we take into account the raids in areas where violent confrontations have not been accurately documented for various reasons,” he added. On March 9, 2017, Amnesty International has corroborated further evidence the Saudi Arabia-led coalition has fired Brazilian-manufactured rockets containing banned cluster munitions striking three residential areas and surrounding farmland in the middle of Sa’da city. For his part, Brigadier Sare’e reported in a press conference, last December, that Saudi Arabia and its allies continue to target citizens with cluster bombs and internationally-banned arms in the northern province of Sa’ada and Hajjah, leaving 1,124 people dead and 1,665 others wounded. He pointed out that most of the victims are children, and that most of the cluster bombs are made in US. 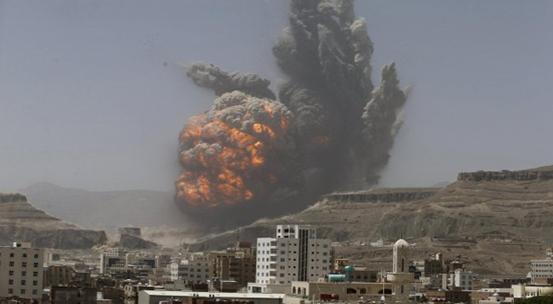 On April 20, 2015, the US-Saudi aggression on Yemen carried out a war crime by throwing an internationally banned bomb with huge destruction on the neighborhood of Faj Atan in the capital Sana’a, later known as the “the crime of Faj Atan”. The bomb killed 84 civilians and wounded 800 people in an area of more than 3 square kilometers inside the city’s residential neighborhoods. Eighty percent of the residents of the neighborhood where the bomb was thrown were destroyed, 700 homes and service facilities were damaged, and more than 200 cars were destroyed. After 20 days of the crime of Faj Atan, on May 11, 2015, the US-Saudi aggression coalition bombed a similar “neutron” bomb on Noqom Mount, according to the statistics of the organizations 120 martyrs and wounded 425 civilians. US expert Gordon Duff has published a report on the Veterans Today website, which contains scientific evidence about the bomb that targeted the Noqom Mount in Yemen. Duff said in his report that “an Israeli aircraft painted with the colors of the Saudi Air Force is the one which dropped the neutron bomb.” He pointed out that “the bomb is not conventional – 2 kilo – it is much larger.” The American expert explained that “by showing the video through a specialized camera revealed the presence of neutrons in the bomb that was dropped.” Veterans Today posted the video of the explosion of the neutron bomb dropped by an Israeli Air Force plane on the Noqom Mount. The video said “May 20, 2015”. The US-Saudi aggression and siege on Yemen have caused the worst humanitarian crisis in the world between displacement, famine, and cholera, according to the United Nations. Nearly four years of aggression, siege and severe economic decline are driving the country to the brink of famine and exacerbating needs in all sectors. According to the UN Office for the Coordination of Humanitarian Affairs (OCHA) in February 2019, an estimated 80 percent of the population – 24 million people – require some form of humanitarian or protection assistance, including 14.3 million who are in acute need.